Creamy, cheesy crab lasagna rolls filled with fresh crab, spinach, and Italian cheeses, then topped with a flavorful blue cheese sauce. 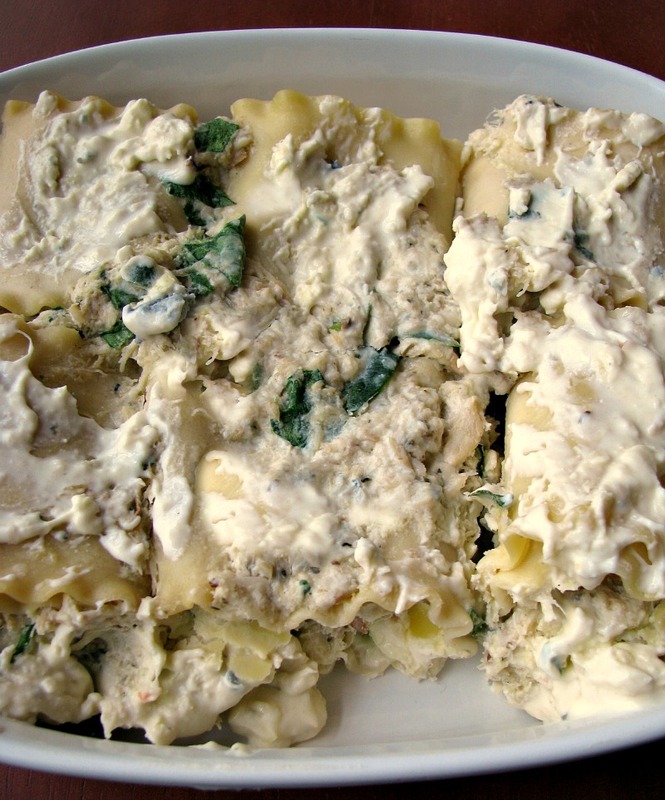 I already new I was going to make a blue cheese sauce for these crab lasagna rolls when I finally bought a copy of Essentials of Classic Italian Cooking by Marcella Hazan. I had wanted it for a long time, and I’m sure I’ll be making tons of the recipes from it. There was a recipe for a Gorgonzola sauce that sounded delicious, so I doubled it for the lasagna rolls and substituted regular blue cheese instead. About the lasagna rolls themselves, you need these in your life. NEED. THEM. They would be great for a romantic dinner for two, or a bridal shower, or Sunday dinner. It doesn’t really matter when, just so long as you do! They are creamy, cheesy, loaded with crab, and filling. I was only able to eat one and a half the first time. Two the second time, because they are so good. Even the picky kid at some of it, but I think it was because she loves blue cheese. First, prepare the sauce. 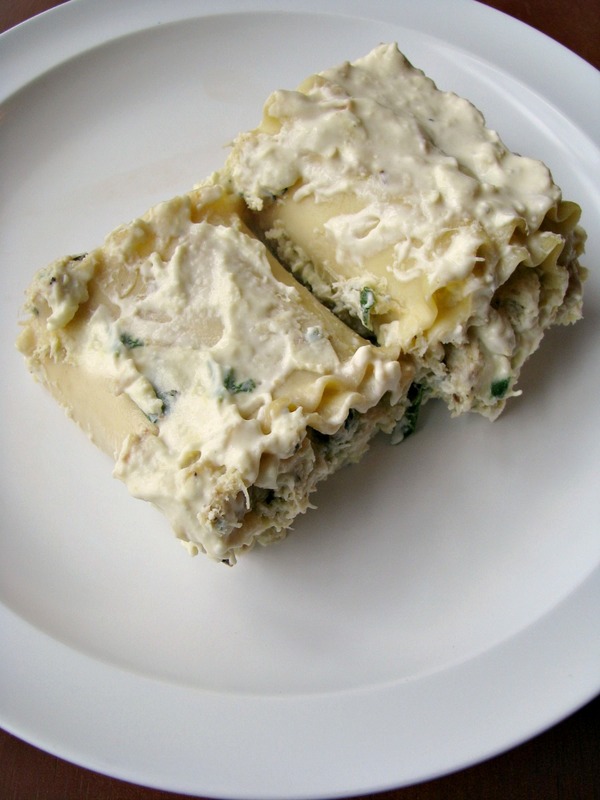 Place the blue cheese in a medium saucepan with the milk and butter, and place on the stove over low heat. Stir with a wooden spoon, breaking up the cheese as it melts and stirring into the milk. Once all the blue cheese is broken up, add the parmigiano-reggiano a little at a time, and continue to stir until completely melted and smooth. Remove from the heat and stir in the heavy whipping cream. Set aside to cool. Cook the lasagna noodles according to package directions, then rinse under cold water and lay out separately so they don't stick. 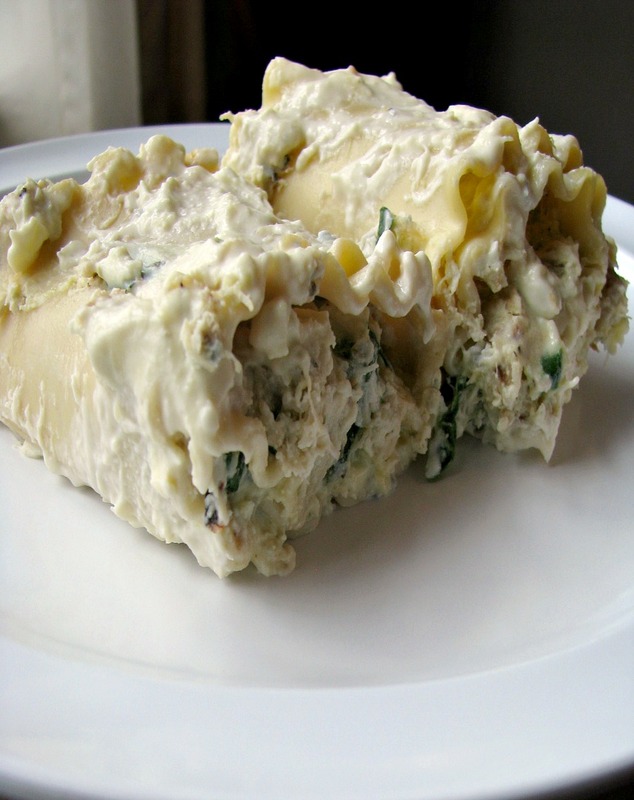 In a mixing bowl, combine the crab meat, ricotta, mozzarella, torn spinach, and eggs; stir well. Add in the Italian seasoning, garlic powder, and nutmeg; stir well again. Preheat oven to 375 degrees F and spray a 9 x 12 baking pan with cooking spray. Leaving a 1-inch gap at the top, place about 1/4 cup of the crab mixture on the upper end of each lasagna noodle, then roll the side with the mixture up to the bottom end. Place in the baking pan seam side down. Pour the cooled sauce over the top of the lasagna rolls, cover with aluminium foil. Bake in the preheated oven for 30 minutes, or until bubbly and heated through. Can you substitute with a different cheese? Not crazy about blue cheese. Thanks!! Hi Sue, sure, what about goat cheese crumbles for something creamy without the tang of the blue cheese? 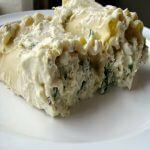 Feta would also work, but it is as strong tasting as blue cheese. Let me know what you end up using, and I hope you like it! I think I’ll try it with the goat cheese–that sounds yummy! I’ll let you know how it turns out. Will be making it this week. Thank you!! The goat cheese turned out great. Added an additional 1/2 cup parmesan to add some flavor. Success!! The hubby loved it!! Thank you!! The goat cheese turned out great. Also added about an additional 1/2 cup of grated parmesan for some extra flavor. Hubby loved it!! Thanks for the great recipe!! That’s great Susan! So glad you liked it!